This post will be a little shorter, but I wanted to finish up my vulnserver TRUN exploit paths. If you haven't read my previous write-up on the "TRUN" command, then I suggest you start with that one. This exploit will pick up somewhere in the middle of the last one, with a different exploit path. In this case, I will go with the standard vanilla EIP overwrite with a JMP ESP. For another example, you can visit the following write-up. First, I started by taking a look at the modules again. In this case, I decided to use the essfunc.dll, as I would not need to worry about null bytes. Next, I used mona to search for a JMP ESP in the library. I selected one of the instructions randomly (0x625011af), and updated my payload. As you can see, the breakpoint was hit as expected. Additionally, the stack has my interrupts, so the exploit can now be finished! With my skeleton in place, I generated some reverse shellcode to connect back to me. Once I added the new shellcode to my exploit, I resent the full payload. 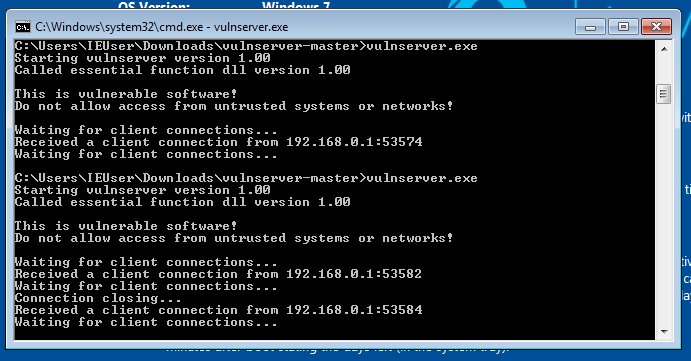 As you can see, I was able to catch the reverse shell and complete the exploit! Additionally, the server was not crashing at all, as seen in the following screenshot. Here is the final exploit that I used for my reverse shell. This finishes up the TRUN command, although this exploit was obviously easier than the last one. I'm hoping to finish up the rest of the commands soon, but that might have to wait for some other posts. You can find the final exploit in my GitHub repository, but let me know if you think there is anything that I should add.